Once the deployment finishes, you can access the welcome page from your browser: http://SERVER-IP/. The main directory to deploy your PHP application is /opt/bitnami/apache2/htdocs. You can copy your PHP application files to that directory and access the application via your browser. If you do not have a PHP application yet, we suggest deploying the PHP info example. Do you have issues trying to connect to your server? Check our FAQ. You can install additional Bitnami applications on top of an AMP stack using module installers. 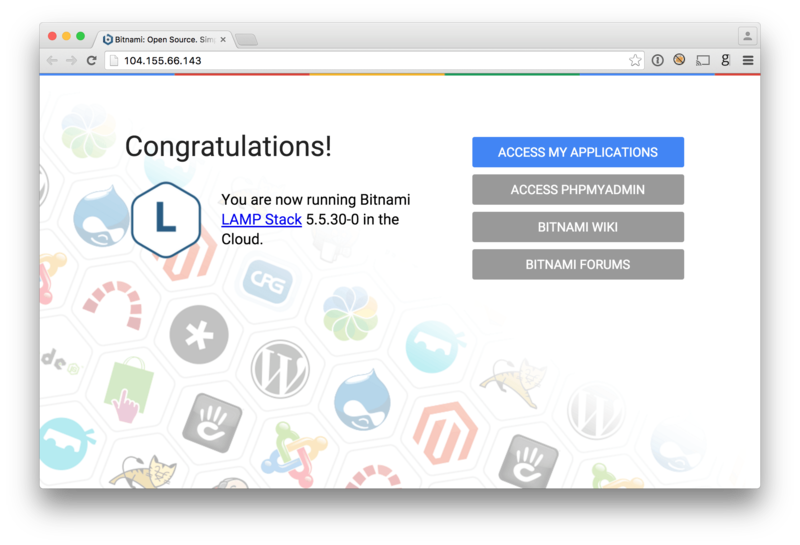 You can download WordPress, Drupal, Magento, Moodle among other applications from the Bitnami website and extend the functionality of your server. You can see more info in our step-by-step guide on adding applications. phpMyAdmin is a PHP-based application intended to handle the administration of MySQL over the Web. Find more information on how to access phpMyAdmin.